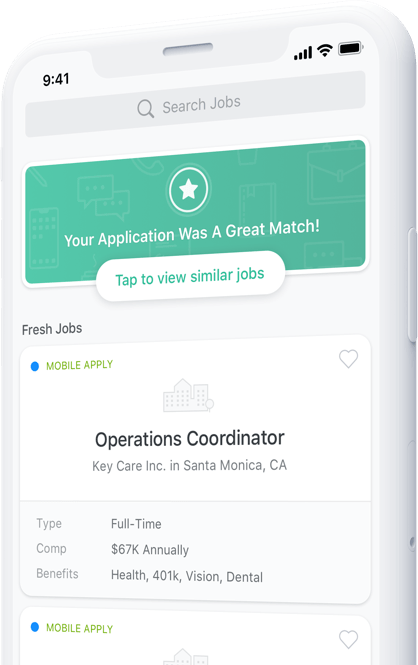 ZipRecruiter lets you apply to jobs anytime, anywhere. I found a new job and got hired in four days total. Thank you ZipRecruiter! Getting a job was quick and easy. I really was hoping to get a call back from my dream employer, and I am happy to say they hired me! Thank you ZipRecruiter for helping me find my dream career! I'm excited about new career path. ZipRecruiter makes it easy to apply, and I was hired fast! This job is going to change my life completely. With access to millions of jobs, applying from your phone has never been easier. Unlike other job sites that leave you in the dark, ZipRecruiter alerts you the instant your application is viewed.